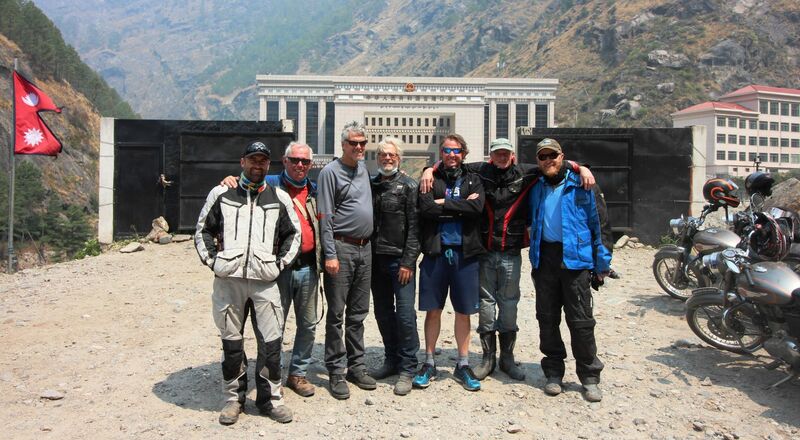 Down to 5 riders, Rob, his son Jack, the Chinese fixer and the chase crew we pull up the massive and imposing Chinese border in Kerung. We are greeted at the Nepali side with smiles, very few formalities besides checking our passports and saddlebag contents. The bridge crossing into the Chinese side of Tibet is intimidating. We can only ride half way, are stopped by a guards, must dismount, then we must walk our bikes to the actual Chinese border. This is it, this where the rubber meets the road. My hearts pounding as I walk the motorcycle past armed Chinese guards, we have come so far. Rob leads the way and stops at the check point. A conversation ensues, it becomes heated, our Chinese fixer is raising his voice and chattering in Mandarin to the guards, Rob is rattling In Nepali when suddenly a hi-ranking official storms out of a glass mirrored office stares at the commotion for 5 seconds, waves his hands in the air and storms away. The scene goes completely quiet; Rob turns to us and says that we need to go back to the Nepal border, now! As we walked our motorcycles back to the checkpoint my heart sank. I knew this was a risk, we all knew. I had booked this journey 10 years prior and the Chinese pulled the visas because of unrest in Tibet. This very trip had been cancelled for the last three years because there was no border. 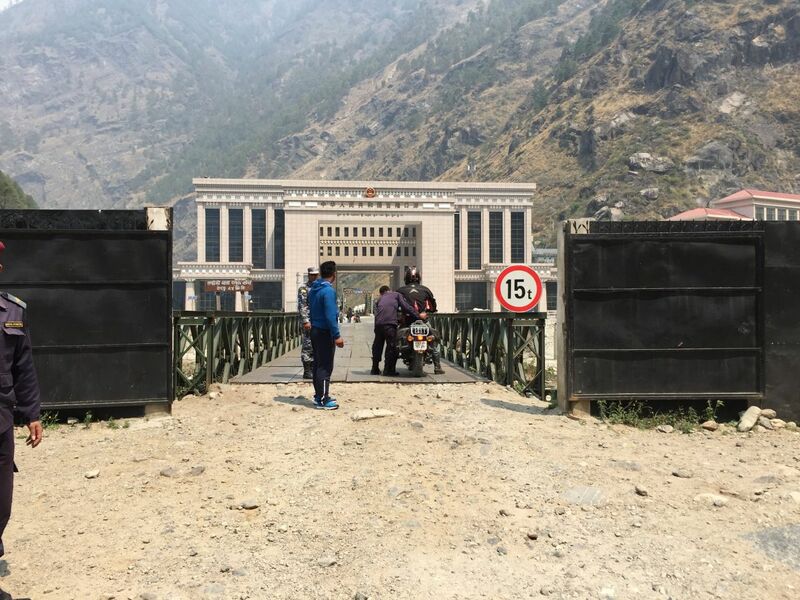 Rob warned us all, he was clear that his first time at the new border would determine if there would ever be another Himalayan Road Runners Kathmandu to Lhasa journey again. I was getting sick to my stomach thinking about reliving the prior two days over again. And what was the reason? It was lunch time. Turns out we had pulled in a few minutes before the Chinese had their officially designated lunch break in which everyone at the border has to take lunch, all at the very same time and we had to return in two hours!, Guess what they were having for lunch. A huge relief but now we have to sit on the Nepal side and go through his again. So what do 3 Aussies, 1 Kiwi and 3 Yanks do at the Chinese/Tibet border for 2 hours? Play Cricket of course. A rousing match ensued, the Yanks learned how to play Cricket, the Aussies got on splendidly and the Kiwi kicked some arse! 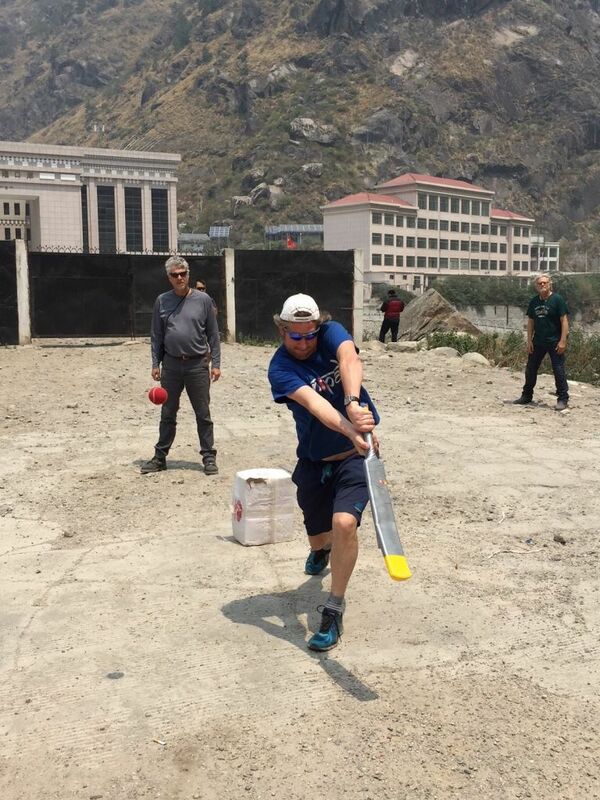 I surmised that the Chinese watched our cricket game on the many cameras pointed at the border because when we finally were processed, it was much smoother than expected. In fact, there was a TV crew from CCTV filming and interviewing one of the border officials. They were filming us as we went through and turned out we were the first group of motorcyclists to pass through the new Chinese border. A big event since the alternate route we just rode was a complete disaster. How apropos, Himalayan Roadrunners the very first company to offer such a ride and was now the first to pass the border. It was done! The entire team was now in Tibet and what a shocker it was. Brand new two-lane roads beautifully banked turns and switchbacks, massive lighted tunnels, secured embankments, rock wall protection. The Chinese had spent the last 3 years building a road that obviously has some future transportation plans for Nepal. It was a welcome relief to the prior two days of riding.